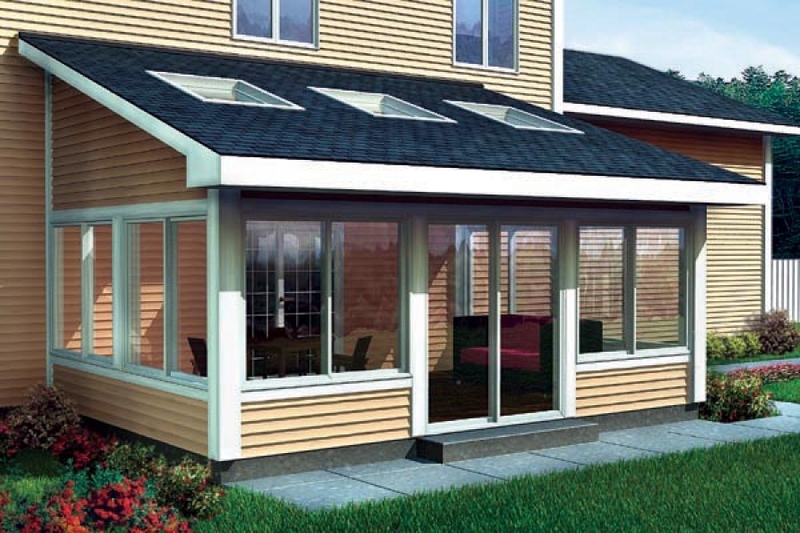 The bones of your sunroom are all there – windows, floors, ceiling and maybe even some classy seating arrangements. But your sunny lounging space still needs something, whether it’s a touch of personality, a bright shot of color or revamped flooring. Up for the challenge of upgrading your sunroom? Get inspired with these tips and tricks! Take a good look at your space. What do you see? The “bones” of your space set the tone for everything that goes in it: this includes flooring, wall color (or wall finish), ceiling, and other architectural elements that give your room its distinctive atmosphere. Tile and stained concrete are both tempting options for sunroom floors since they lend a breezy, sophisticated atmosphere to a sunshiny space. If you’re looking to make a big impact with your floor, tile is a fantastic choice—it’s sophisticated, you can do it yourself (with a bit of practice and know-how), and your options are endless. Opt for a cozy, rustic brick feel, or perhaps Moroccan elegance with colorful tiles boasting a cool, casual feel. This Old House offers step-by-step instructions to lay your own tilefloor. Keep in mind that when you’re laying your own tile, the simpler the pattern, the better. For a Tuscan feel, go with a light Tuscan plaster wall treatment, and offset the coziness of your wall color with breezy, cream-colored sheer curtains or other light window treatments. Coupled with sophisticated furniture, you’ll love your understated Italian-inspired getaway, but make sure you don’t overdo the accessories and clutter up the look. If you live in an apartment or a rental home that doesn’t lend itself to major overhauls, you still have plenty of options for updating your sunroom’s look. ForRent.com offers countless ideas for designing your rented space. Something as simple as new patio cushions, candlesticks, brightly-colored pillows, or wall art can make your space look like something out of a design magazine. The best part about this kind of design: It’s easy to overhaul your look without repainting! Just view your space as a blank canvas, and fill it with colors and textures representing the style you love. If you’re handy with a needle and thread, sew your own patio cushions and curtains without paying the exorbitant prices that custom design firms charge. Check out SewMamaSew for step-by-step instructions to sew your own patio cushions. Paint is your friend here. The hardest part about this step is harnessing your creativity, so choose a palette and run with it. Try picking up some old candlesticks from an antique store or flea market, then update them with high-gloss paint. Going for a beachy feel? Print a few sepia-toned beach shots you took on your last vacation, then frame them in simple wooden frames you’ve painted to match your style. Repurpose an old wood pallet into a coffee table that adds rustic style, or build a space-saving entertainment center that makes entertaining guests easy even if you don’t have a bar or serving area.